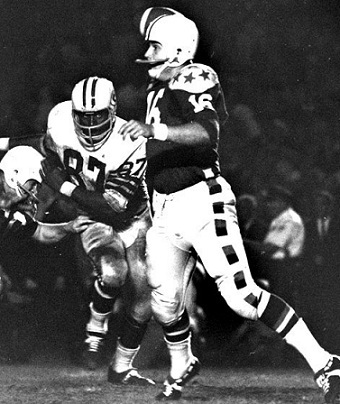 Hard-charging Green Bay Packers defensive end Willie Davis (# 87) glares with intent as quarterback Gary Beban (# 16) from the UCLA Bruins, hero of the Rose Bowl in 1966 and winner of the Heisman Trophy in 1967, looks to unload the football in a hurry during the annual College All-Star Game at Soldier Field in Chicago that was witnessed by a crowd of 69,917 fans on August 2nd, 1968. Notes — It is important to bear in mind that the above chart only lists players who actually made an official appearance in the annual contest at Soldier Field in Chicago, itself, and that participants are listed by the corresponding position played at the College All-Star Game (as compared to the position played for the UCLA Bruins during the preceding collegiate season). Chuck Cheshire, the left halfback who was named Third Team All-America by the Newspapers Editors Association and accorded honorable mention status by both the Associated Press as well as the United Press as a senior in 1935, was one of 51 players selected for the College All-Star squad that faced the defending National Football League champion Detroit Lions in 1936. The 170-pound homegrown product out of Los Angeles High School, who established the UCLA school record for rushing yards in a single season (864) that stood until 1955 and still holds the Westwood school record for longest rushing play from scrimmage (93 yards versus Montana in 1934), had been the second round pick (# 17 overall) of those very same Detroit Lions at the 1936 NFL Draft. However, despite reportedly acquitting himself rather well during the training camp practice sessions prior to the game, Cheshire was not among the 32 total players used against the Lions by All-Stars head coach Bernie Bierman from the University of Minnesota Golden Gophers. Jimmy Johnson, the Pro Football Hall of Fame defensive back whom the San Francisco 49ers had chosen with the sixth overall pick in the first round of the 1961 NFL Draft after the right halfback had averaged 8.5 yards per attempt on 21 rushing attempts and 18.1 yards per catch on 14 pass receptions as a senior for the UCLA Bruins during the 1960 NCAA season, was named to the College All-Star squad in 1961 but did not make an appearance in the annual classic at Soldier Field in Chicago.